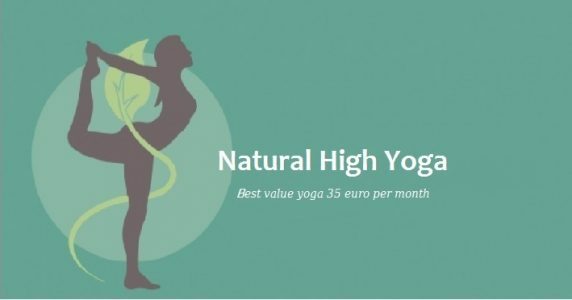 In my lessons at the Natural High Yoga School I will use mainly Hatha Yoga techniques to help create more body-awareness. Through classic Hatha Yoga assanas and exercises we will research the possibilities in which our bodies can create more space, flexibility, strength and balance. Engaging in mindful movement to expand body-awareness, moving out of your head and more into your body. Different types of bodyscans will be used: in meditation, in movement and for relaxation. This allows you to be able to hold assanas longer with more attention in your body. We will learn the basic movements and asanas from the classical Hatha Yoga. The lessons are accessible for beginners but They also help more experienced yogis deepening their practice. Safety, affection, skill, consideration and diligence are keywords in my lessons. I like to put focus and attention on a straight back and good positioning of the hips. We learn to stand, lay and sit in a responsible, and say, strong way. By doing this we will be able to meditate in a more comfortable position and for longer periods of time. We also work on strength, flexibility and relaxation”. I did a 600 hour Raya Yoga training bij Annemiek Latour in Amsterdam East. I am specialised in chairyoga asswell. Next to that I also give young children yoga-lessons and lessons in body-awareness on elementary schools in Amsterdam and on festivals in Holland. In the past I have been a fanatic ice, inline and rollerskate-dancer. I have a background as an amateur dancer, modern and classical ballet. Therefore, I have developed very good balance in my body over the years. At the moment I am involved in meditative dance-forms like 5 Rhythms, Butoh and Medicine Movement. And I have experiences in Gi-Gong, Tai-Chi and the different forms of yoga exercises like vinyasa. Hope to see you in my lessons.